The cast of The Music Man. Image by Abe Ariel Productions. The atrium was filled to the brim with the anticipation of greatness. Countless people scrambled to purchase last minute tickets and find family members who seem to have misplaced time. The atrium in three hours time transitioned from one of anticipation to one of satisfaction. 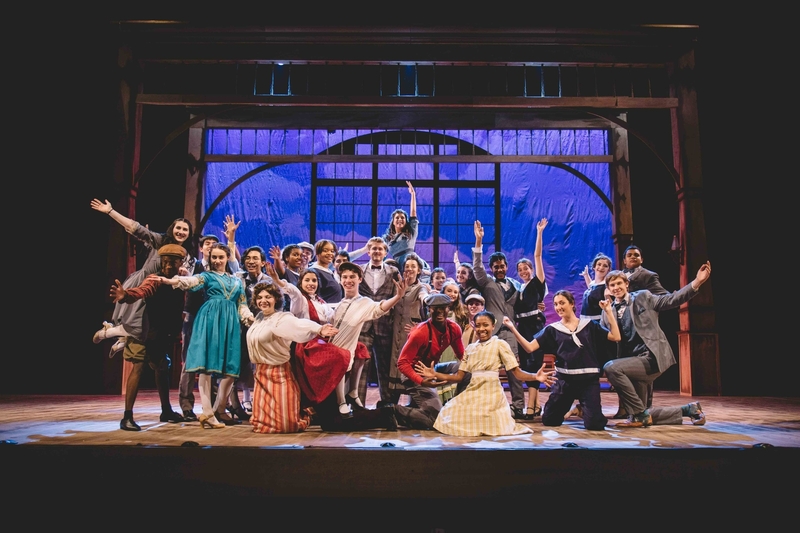 The Music Man did not disappoint, fulfilling the promise of a night adorned with musical excellence, great choreography and exquisite costumes. Stagecraft did a wonderful job making the perfect props for a believable scenery of 1912 rural River City, Iowa. Everything from the train set, to the making of the footbridge, the light display, music cues and even the band costumes, were handled beautifully and artfully by the stagecraft crew. The mystifying production began with a thrilling start of our fellow musicians whose perfectly old time fanfare cut through the dark of the night and was played with refined professionalism. The cast began with a flawlessly recited rhythmic skit, fully letting their characters envelope them. Spectators were in for a treat of music sung by male actors whilst they danced and the women who fanned through their way on stage. Audience members gazed in awe at the characters as they put on a show through their mannerisms. Senior Patrick Mahowald as Harold Hill was a flawless fit. Patrick captured a Harold Hill who is full of charisma and charm, brooding with a conniving confidence. It is all the more interesting to see Harold befallen with the integrity brimmed Marian played by Junior Claudia Humphrey. Throughout the whole production the supporting cast never dropped character. The lively “Pick-a-Littles” of River City always provided comedy from their voices to their body language, arousing laughter from the crowd every time they hit the stage. Courtney Long as Eulalie Mackecknie Shinn was superb. Courtney depicted an Eulalie that no one else could compare to. The musical was made truly engaging when the newly and compulsively bound Quartet sang throughout the crowd. One of the most engaging aspects was the part of the ensemble that ran through the crowd in search for the wanted Harold Hill. The amusement of the crowd rang as the heartening performance of Martina Coronel touched the spirits of audience. It’s challenging to not find oneself captivated by the love story between Harold and Marian. The characters left viewers at the edge of their seats hoping for that final satisfying moment when they kiss and accept the love they have for each other. The chemistry of the cast allowed for them to be truly outstanding, executing each scene expertly, proving that the months of rehearsal tirelessly were not in vain.